A marine mammal resembling a dolphin but without a beaked snout. Historically, the term grampus was sometimes used to refer to a killer whale.. Nothing of importance happened today." Mar. 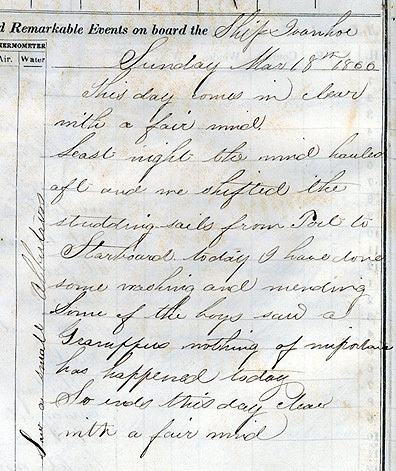 19: "This P.M. we have been at work lashing and making everything secure for bad weather." The capital city of Uruguay, a country north of Argentina, on the Atlantic coast of South America. ....This P.M. the wind is breezing up again; the Capt. is having fine sport catching Sea Gulls with a hook and line." To drive oakum or cotton into the seams of a vessel's deck or sides, to make it watertight. After the oakum is driven in with a caulking iron or mallet, the seam is "payed" or coated with hot pitch or other compound to prevent the oakum from rotting. the deck." Mar. 25: "Got the Life of General Lyon from the ship's library and find it very interesting." Sailors' nickname for Cape Horn. and God only knows when we shall be." Sailors' nickname for the storm petrel, a sea bird. up to an albatrossAlbatross "Albertross"
A large, web-footed sea bird with long, slender wings for gliding. The albatross is among the largest sea birds.."
A port city in southwestern France. bound to San Francisco, sixty days out." Mar. 31: "We keep in company with the Bark pretty well although she can whip us, in fact most anything can that has a hull and a little piece of canvas. The Ivanhoe was a big thing on little wheels in New York but at sea she is not what she was cracked up to be."